Our two best selling products are our 7-Pin Ultimate Adversary Lock and our 14 Piece Lock Pick Set with Rubber Handles. We’ve decided to offer these two products together at a big savings over purchasing both items separately. Together, our most popular practice lock and our most popular lock pick set are everything you need to master the skill of lock picking. SKU: 7 Pin Combo-Kit. 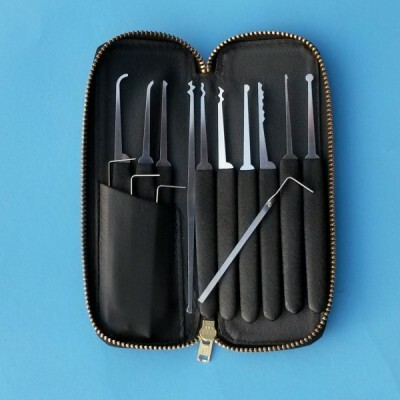 Categories: Lock Picks, Practice Locks. Brands: LearnLockPicking, SouthOrd. 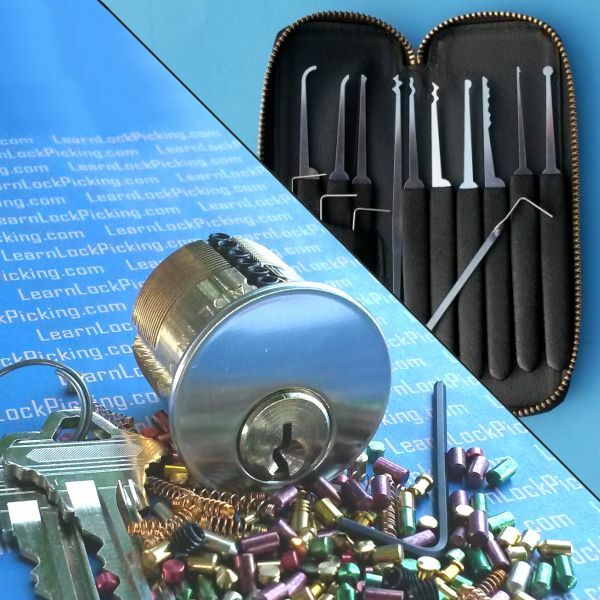 Our Seven-Pin All-In-One Lock Picking Training Kit puts our two most popular products in one package at a discount. This kit includes our Ez-Rekey Ultimate Adversary Lock, the one practice lock that is easily re-keyed for the beginner through expert lock picker. Our 7 pin lock includes more than one hundred assorted top, bottom, and master pins. Also includes spool, serrated, and T-pin style security pins. Millions of challenges are possible with this one easy to re-key practice lock. The included 14 piece lock pick set is our best selling lock pick set and has all the tools you need to develop the skills to master lock picking. an assortment of spool, serrated, and T-pins. New to this hobby. I purchased some clear locks and they are very easy. This is much more of a challenge. Using the basic setup with the key and instructions sent and only using the first two pins. I can pick but I need more practice before I add my third pin. Works great, I can’t pick the thing! Very nice tolerances and smooth operation (with the lock). This has many pins and changing things out is very easy. I’ve never put together or taken apart a lock before, but it was very straightforward. As mentioned, the only improvement I can see would be a top of the key way tensioner. It wouldn’t help me pick it faster though, I’m pretty sure. I don’t think there’s a better option out there if you’re starting. 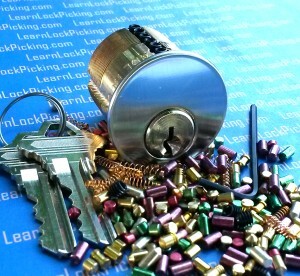 You learn lock picking with a variety of pins and gradually work up to more difficult locks. The key way itself is a good challenge to learn how to work with picks in relatively tight spaces. A top of the key way tensioner would be handy as I found myself losing control of the core to try to pick some difficult spools. And I could only tension in one direction without binding up the core with the provided tensioners (made for a good first lesson). Excellent kit! I could see adding some other spring types to this as well. great training kit for the money. This was well thought out and simple to use. You can practice picking as many pins as you want and type of pins. Being a new locksmith this is a great training aid I am glad I bought it. I had look at other training locks this was by far the best. It beats the old stuff my boss gave to practice picking. Great kit! the keyway is way more challenging than the master locks I’m used to, the pin selection is excellent, and the picks seem pretty high quality, although some hand finishing is necessary. For the price this kit is fantastic!